River Valley catcher Brooklyn Sizemore leaps to catch a throw as Meigs senior Alyssa Smith (11) slides home safely during the third inning of Monday night’s TVC Ohio softball contest in Bidwell, Ohio. BIDWELL, Ohio — Early and often. The Meigs softball team built a 10-1 lead midway through the third inning and ultimately cruised to a 14-6 victory over host River Valley on Monday night in a Tri-Valley Conference Ohio Division contest in Gallia County. The Lady Marauders (4-3, 1-0 TVC Ohio) did most of their damage early on as the guests established leads of 2-0 and 5-1 after each of the first two frames. Breanna Zirkle doubled in Taylor Swartz with one away in the top of the first for the eventual go-ahead run. The Maroon and Gold — who had six hits through two innings — produced another four safeties to go along with two walks en route to a five-run top of the third, making it a nine-run contest 15 outs into regulation. The Lady Raiders (2-5, 0-2), however, answered with a two-RBI single by Kaylee Tucker in the home half of the third for a 10-3 deficit. 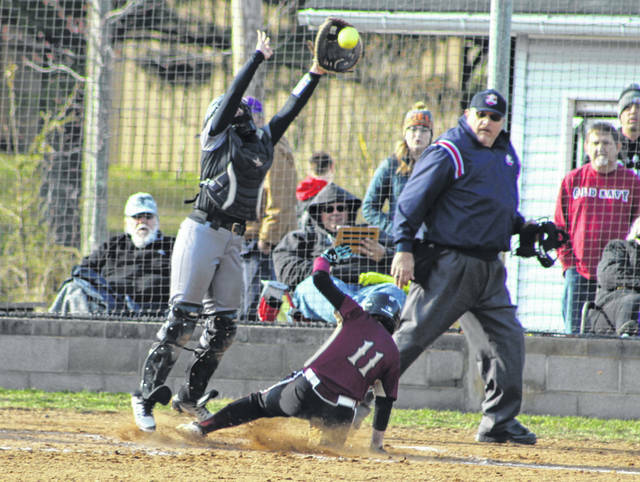 The Silver and Black — who swept a doubleheader at Fairland last Saturday by scores of 17-5 and 16-1 for their first victories — kept their offensive momentum moving forward in the fourth after plating three runs while trimming the gap down to 10-6. River Valley was never closer as it had only five baserunners over the final three innings, with only one making it beyond first base. MHS produced a run in the fifth as Ciera Older doubled in Swartz with two away for a five-run edge. Katie Hawkins singled home both Hannah Tackett and Swartz in the seventh, then Older scored on a one-out error three batters later to wrap up the eight-run outcome. The Lady Marauders outhit the hosts by a 16-12 overall margin and also committed four of the five errors in the contest. Both squads stranded eight runners apiece on base. Zirkle was the winning pitcher after allowing five earned runs, a dozen hits and two walks over seven innings while striking out eight. Baylee Hollanbaugh took the loss after surrendering five runs (two earned) and six hits over 1.2 frames while fanning one. Swartz, Older, Zirkle, Hawkins, Tackett, Bailey Swatzel and Jerrica Smith led a balanced Meigs attack with two hits apiece. Hannah Durst and Alyssa Smith also had a hit each for the victors. Hawkins knocked in a team-high three RBIs, with Older and Zirkle each driving in a pair of runs. Swartz scored a team-best four runs, while Older, Durst and Tackett crossed home plate twice apiece. Brooklyn Sizemore led RVHS with three hits, followed by Skylar Jones, Chloe Gee and Sierra Somerville with two safeties apiece. Tucker, Kasey Birchfield and Grace Hash also added a hit each in the setback. Tucker led the hosts with two RBIs, while six different players scored one run apiece.